We’re excited to announce we will now be offering in-house movement assessment and recovery sessions at EVF Upper East Side. You can now schedule an appointment at the gym with physical therapists and chiropractors to help diagnose, rehabilitate and prevent injury. EVF is partnering with professionals (and EVF members!) Dr. Nicholas Rozborski and Dr. Georgio Baylouny to offer these sessions. Georgio and Nick offer a variety of services and techniques including injury diagnosis, joint manipulation, soft tissue mobilization, taping, guided mobility and corrective exercise. They will meet with you, assess the problem and choose the right combination of techniques to treat you — and help you feel and move better. 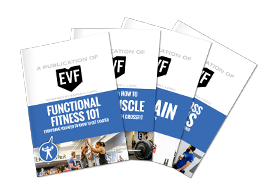 They are also both CrossFit members at EVF, so they understand what we do every day and share our goals of wanting to lift heavy, move fast, and do it all pain free. For more on Nick and Georgio, read below. If you have a nagging injury or find yourself constantly modifying certain movements because of pain, this is definitely for you! *Additional time slots may be available, so if you want to come in but these times don’t work, reach out and see if you can find a time that works. Not sure if this is for you? Stay tuned for our kickoff movement and recovery event on Sunday, Nov. 4 from 1 to 2 p.m. to get a demonstration of the techniques that Georgio and Nick use. Dr Nick is an experienced sports chiropractor and has been a member of EVF since 2012. He offers recovery options such as trigger point therapy, Rocktape application, cupping, Graston, Theragun, therapeutic exercises and guided stretching. While chiropractic adjustments are appropriate for some conditions, they are not absolutely necessary, and he offers a wide spectrum of services and education as his standard treatment. If you get pain during certain movements (i.e. low back pain with kettlebell swings or shoulder pain with lifting overhead) or are curious about how to move more efficiently, he can help. Georgio has a doctorate in Physical Therapy and is residency trained in Orthopedic Physical Therapy. Georgio is passionate about educating his patients and utilizing the most current and effective treatment options in order to get fast results. His active approach to rehab allows his patients to get back to working out with their coach or get back on their favorite CrossFit class as soon as possible, limiting missed time in the gym.